If you need to amend an invoice that's been issued or void it due to an error or it not being payable anymore, read on. While much of Habu is super simple and intuitive, there are areas that are more abstract. Understanding the theory will turn you into a Habu master. Charges are essentially an editable, pre-invoice state that provides flexibility prior to invoicing. To edit or remove a charge you'll need to go to the source of where that charge was created (i.e. in the booking, in the order list or in the list of charges). There is one type of charge that isn't editable and they are charges related to membership subscriptions and membership add ons. I'll explain how to deal with these later. When it's time to request or take payment, either manually or with auto-billing, charges are turned into invoices as the payable state of the charges that have built up. Draft: An invoice has been created but hasn't been formalized or seen by the intended recipient of the email. Issued: An invoice has been formalized either by 'issuing' the invoice or by it being emailed out. You have complete flexibility with making changes to draft invoices and being able to remove them completely. This is because it hasn't been seen by the receiving party as it hasn't been emailed out. Once it's been emailed, the recipient will have had the opportunity to pay the invoice, which is why an issued invoice cannot be removed. Paid: Payment has been taken for the invoice either via card through a Habu integration, or manually 'recorded as paid'. No further action can be taken with a paid invoice, other than refunding it. Void: The invoice has been voided. No further changes can be made. Refunded: The invoice has been refunded. No further changes can be made. With a draft invoice, you have the option to 'Remove Invoice'. release the charges and reassign them to the contact. This enables you to then edit and create a new invoice or remove the charges. remove the invoice from the invoice list. While the invoice will be removed, the invoice number generated will have been 'fixed' and permanently assigned to the draft invoice. If there are gaps in your invoice numbers in billing, it will be due to removing draft invoices. void invoice without writing off the charges. 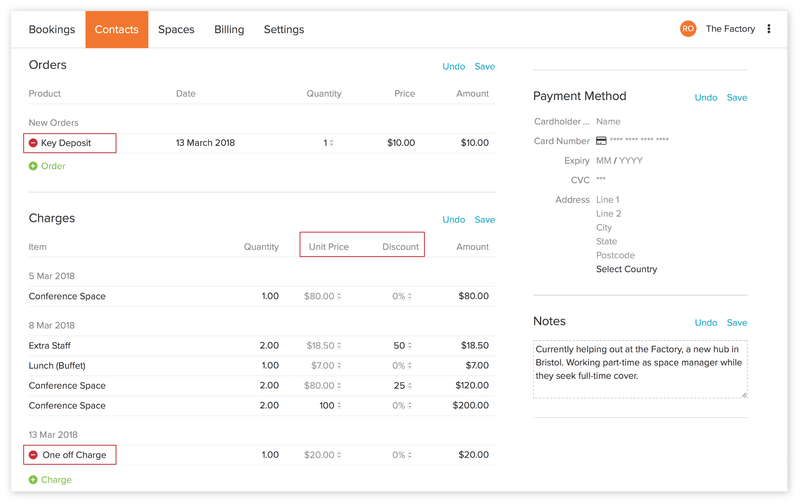 This will allow you to edit the charges and then re-invoice. void invoice and write off the charges. This will permanently remove the associated charges. It's vital that you select the correct option here. If you don't want to see the charges or the invoice again, make sure you check the 'Write off charges' box. If you don't do so, the charges will be reassigned to the contact. If you have auto-invoicing set up, these charges will be collected into a new invoice and potentially emailed and payment taken, depending on your settings. Charges related to bookings. You can edit the 'Unit Price' or the 'Discount' from both the contact page and the booking. To edit the 'Quantity' of resources or to remove an unwanted resource on the booking page you need to go directly to the booking itself. Charges related to products. You need to click on the 3 dots of the product under Orders on a contact profile. Select 'remove' and it will remove the product and the associated charge. Note, you need to manually refresh the page to see the change for this. Charges related to one-off charges: Select Edit in charges and use the red delete button. Charges related to subscriptions or add-ons: These charges are not editable. I'll cover this in a moment. That's the membership charge removed now. What you need to do is then create a new one off charge, which you can price and label as needed, and then invoice.